Seeing the title of this post makes me a little sad, because I'm never ready for summer to end! But I realized during my trip to NYC (when I packed summer clothes totally inappropriate for the actual weather) that fall is closer than I'd like to think. And while I'm not a fan of summer ending, I am a fan of an excuse to go shopping. 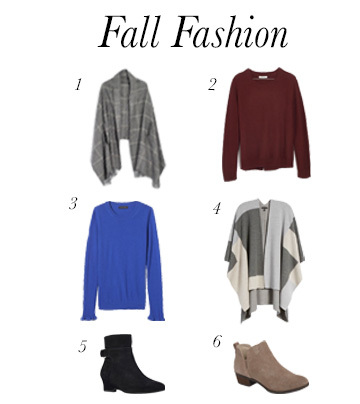 So I've pulled together some of the styles I'm looking forward to for fall! One of the reasons I hate fall (and winter!) is having to deal with layers and jackets. I can't put a jacket on/off by myself, so the colder weather forces me to be trapped inside a lot more - it definitely cuts down on my mid-day Starbucks runs! But I've been loving that capes are back in style, and I really love the two above. They absolutely look like part of an outfit, but they're so much easier for me to wear than a jacket with sleeves! Once the temperatures drop, I basically live in sweaters. My style definitely veers towards classic, and not too trendy, but the two sweaters above each have a fun little detail that keeps the sweater from looking too traditional. And finally, the shoes! I'm not ready yet to think about real booties, but I can get behind booties. I have really small feet - I wear an adults size 4, or a kids size 2-3 - and I'm always on the hunt for booties that fit well. I love that the black wedge pair is a little more polished, while the tan pair could be worn on more casual days. What are you most looking forward to about fall?